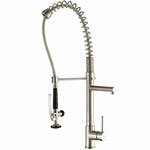 4.5 $335-410 22.5″ Spout Reach 1 1.5 GPM Stainless Steel, Chrome Faucet has ultra high-pressure sprayer. Plus hose extends up to 4x more than average. Duralock system makes installation extra easy. 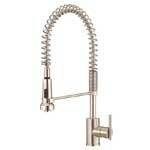 See complete Moen Align review here. 3.5 $290-300 22″ 6″ 1 2.2 GPM Stainless Steel Deck plate included. 5.0 $630-650 24.5″ 10.0″ 1 1.5 GPM Oil Rubbed Bronze Uses 30% less water than 2.2 GPM models. Features magnetic docking system for spray head and “Berrysoft” light spray feature for gently washing produce. Plus, nozzle designed to stop mineral build-up. Stainless, nickel and chrome options here. 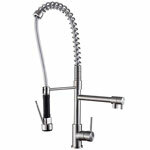 4.0 $270-350 22.25″ 8.5″ 1 1.5 GPM Lustrous Steel, Chrome Features unique sophisticated arched hose holder. Also comes with 2.2 aerator option for more powerful spray. 4.5 $600-630 26.5″ 9.25″ 1 1.5 GPM Starlight Chrome High end design provides superb control over water flow. Switch between spray & stream without turning off water. Speed clean anti-lime control. 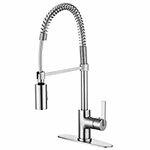 4.0 $660-690 20″ 10.5″ 1 1.8 GPM Chrome, Stainless, Black Stainless Touch-on technology with automatic water flow shut off, LED shows water temperature and magnetic docking station. 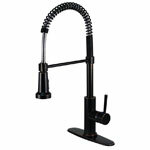 Each spout contains a Neoperl Aerator, which aerates the water. This does a couple of things. First, it reduces side-spray and splash. Second, it lessens water output without decreasing pressure. By wasting less water, you can lower your water bill costs too. Faucets have a ceramic disc cartridge. 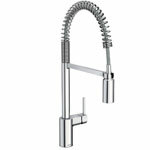 They require minimal maintenance and last the lifetime of the faucet. They prevent/minimize leak and drip problems. 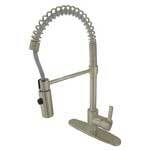 The single handle feature simplifies the look and function of the commercial style faucet. 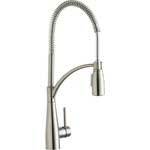 For example, you can control the water flow rate as well as the temperature using just one lever. 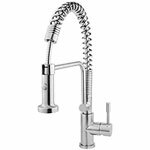 The clean, sophisticated line of these high arc, pull out faucets make them look more like a work of art than a source of water. 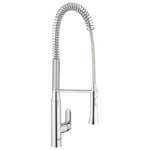 The 1-handle design adds to the ease-of-use without detracting from the modern style. 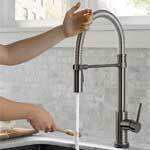 Measure the space around your kitchen sink before buying a high-arc pre-rinse faucet. Although they look really cool, they can be fairly large and overpower some small kitchens. Many manufacturers that offer stainless steel don’t have a satin or brushed nickel option as well. However, if you look closely at the photos, it’s really hard to tell the difference between the 2 finishes. 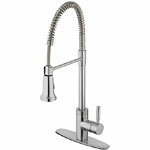 Therefore, the stainless steel color may match nickel hardware in your kitchen just fine. 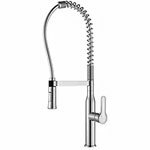 LaToscana manufactures the Elba Single Handle Pull-Down Sprayer faucet almost like the Moen Align that sells at Home Depot. 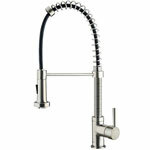 You can find the Rachel Pull-Down faucet at Signature Hardware. 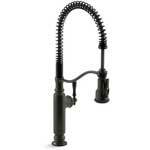 Lowe’s carries several brands, including Grhoe, Kohler, Kraus, Moen and Kingston Brass. However, I have found their prices to usually be a little more expensive than on Amazon.